Trump already shrank two national monuments just this week. Interior Secretary Ryan Zinke has recommended changes to 10 national monuments only a day after President Donald Trump cut the size of two other national monuments. Zinke recommended shrinking four monuments and changing how the U.S. manages six others. Those sites are protected under the 1996 Antiquities Act. 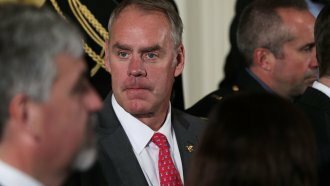 Trump asked Zinke to review the status of nearly 30 national monuments in April. The Trump administration is facing lawsuits based on a recent order to shrink Bears Ears by 85 percent and Grand Staircase-Escalante by almost 46 percent. Zinke said the more than 2.5 million public comments on his review "overwhelmingly" favored the monuments remain unchanged. But Zinke pushed back on that, saying "I don't yield to public pressure."